Family is what Anglers is all about. My father, Buddy, opened Anglers over a decade ago with the vision of creating a dining experience that made you feel like family. Now with three locations our family is getting pretty big! So the next time you're in the Searsport, Newport, or Hampden area, stop in and let our family serve yours! We'd love to see you! Whether you're with the spouse you see every day or the classmate you haven't seen since graduation, join us for lunch or dinner and enjoy some of the freshest seafood around. 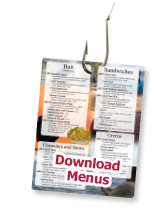 Join our "Fishing Buddies E-Club" to stay on top of everything going on and we'll even send you a coupon for a free dinner on your birthday! Click for more details. Our conference room in Hampden is now available for your private party, office luncheon, or corporate meeting. The room has private access if needed (not handicapped accessible), can be closed off from the main dining room, and also has an 8" x 10" projector screen. In most cases, when providing your guests with a meal the room is "rent-free", call John Moody at (207)862-2121 with any inquiries. In addition to our famous fried seafood, we have a large selection of desserts that we make ourselves in-house. Our Toll-House Pie, ordered ala mode, will soothe anybody's sweet tooth for days! Have sugar tolerance problems? No problem, we've got sugar free desserts too, even fresh sugar free whipped cream! Don't worry, you're still alive, you aren't in heaven yet. That's right! 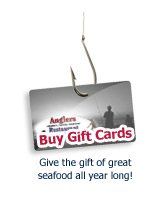 Come in for lunch or dinner and drop your business card in our Fishbowl of Friends for a chance to win a $25 Anglers Gift Card! Keep coming in for more chances to win! And what's EVEN BETTER... If you dont win, we put your card back in the drawing to maximize your chances. See you at Anglers! passion and pleasures yielded by the age old trade of fishing. Anglers is comitted to serving the public and supporting the community which surrounds us. By procuring local ingredients as frequently as possible, we are able to keep money inside our local econimies. Our customers are the backbone of out success. As always, it will be, and is, our pleasure to serve you. If made, the winner gets a $100 gift card to Anglers!